A pass of Matt Kenseth with two laps to go gave Kasey Kahne the victory Sunday night at Atlanta Motor Speedway and along with it a berth in the Chase for the Sprint Cup. 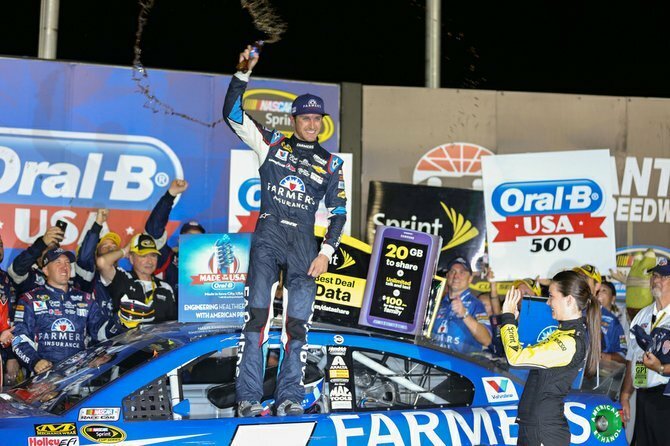 Kenseth finished second and also clinched a spot in the Chase on points. Kahne held the lead over Kevin Harvick when Kyle Busch dumped Martin Truex Jr. bringing out a caution flag with two laps to go. Restarts were the key for Kahne. He passed Harvick and Hamlin for the lead with 24 laps to go, and then blew past Hamlin and Kenseth on the final restart. Three years in a row all four Hendrick drivers have qualified. “It took a lot,” Kahne said. “We were all over the place. The guys stayed with me and worked hard. In his first race back after missing three races, Tony Stewart cut a right-front tire and crashed just past halfway.. He ran in the top 10 during the first 100 laps until contact with Kyle Busch sent him into the wall. Holtby for Record or No?